Enjoy your vacation in this direct ocean front home. You will have unobstructed ocean and salt marsh views from every room just steps from 'Peggotty Beach', a soft sandy barrier beach. 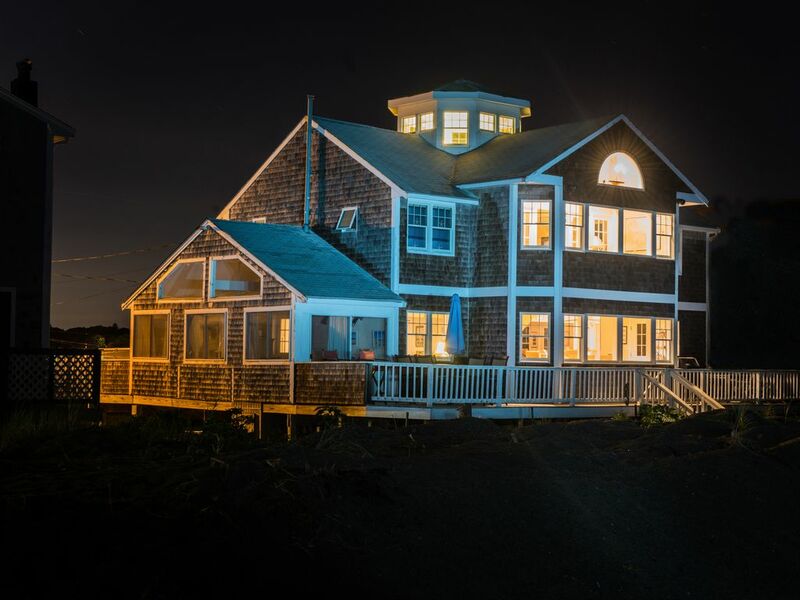 Experience morning ocean sunrises and evening moonrises, beach walks, clambakes, kayaking, swimming, paddle boarding and bicycling. The open floor plan and wrap around deck is perfect for family parties (only) entertaining family and friends. The house accommodates 10-12 people with thoughtful amenities included. This luxury home comes complete to make your vacation a memorable experience. Perfect for spring, summer or fall vacations, holidays, anniversaries, special occasions or an off season long weekend getaway. To reserve this home call Sara at 330-329-4117. A port-a-crib, baby monitor, high chair, toys, videos and games for children. 3 kayaks, 4 bicycles, 3 paddle boards. Large screen TV/DVD home theatre. The house is thoughtfully furnished to make your stay a pleasurable experience. We have many beach chairs, outside deck seating for dining and entertaining with a gas fire pit for evening enjoyment. We rented the Mayflower House for a gathering of friends celebrating a successful work venture. Many of us were from out of state so it was important that the house was well stocked because we couldn't bring anything of our own. This is the best appointed house I have ever stayed in. The setting was gorgeous, on the beach with the marsh out the front. We took kayaks through the marsh, into the harbor and around to the beach. We biked around the beautiful neighborhood. We had a lobster bake, then spent the night all sitting around the gas fire pit. There are enough deck chairs, beach chairs, towels, spices, games, puzzles, cooking and bathroom supplies. I highly recommend this lovely home! This house was quite wonderful--well stocked with everything from shampoo to coffee, clean and nicely decorated. The kitchen has all the spices we could have wanted and excellent appliances. We had plenty of space to spread out in and gorgeous views of the ocean and marsh. While we missed having waves to jump over/surf on, we enjoyed using the several kayaks and paddle boards that came with the house. There are also bikes for getting into Scituate, although it's a pleasant and easy walk from the house into town. Holly you and your family were wonderful guests and it was a pleasure to share our home with you. Thank you for your wonderful review. We hope you will come back again soon! This is my second year renting this beautiful home and my family had another outstanding week. The house is thoughtfully appointed with every detail considered from kitchen supplies, linens, beach chairs, games and puzzles for rainy days, bikes, kayaks and paddleboards. The front deck has plenty of seating along with a propane fire pit for sunset viewing and the back deck great spot for catching a Scituate sunrise. Peggotty Beach is quiet, private and great for swimming and the marsh in front of the house has calm waters for kayaking and paddle boarding into the harbor. Location is perfect for a walk into town for ice cream or dinner or a longer walk down to the lighthouse. Sara is a gracious and helpful host and easy to communicate with. Love, love, love my time in this gorgeous beach house! Thank you Susan! And you and your family are wonderful guests. We look forward to your return next summer! Spectacular views and beach access, comfortable living for our extended family. We made wonderful memories in this gorgeous beach house. It was the perfect home for enjoying time together, with an exceptional back drop of the ocean. We will come back for certain! Thank you Jessica! We loved having you and your family back!! I was looking for an impromptu getaway for Mother's Day weekend for my family and my wife's family. This house luckily was available and let me tell you, it surpassed all expectations. Booking a house "on the beach" you already know it's going to be nice, but the interior was decorated perfectly, the amenities were amazing, and the kitchen was incredible! Sara, the owner, was very easy to communicate with..... I can see why all the ratings are 5 star! The weekend weather was terrible, but it was still a fun, relaxed time. Thank you Sara! Thank you Steve for your kind review! We are so delighted to share our beach house with you!! Just a short walk to town where you can enjoy many restaurants, ice cream shops, special novelty boutiques, book stores, quaint antique stores and art galleries. Scituate also has many historical sights to visit. An original bowling alley above the hardware store and a movie theatre. At the Scituate Town Pier launch your own boat and or anchor in front of the beach house. You can also relax and take the train to downtown Boston from Scituate for shopping and sightseeing. Scituate is centrally located just 30 min from historic Boston, Plymouth Rock and Plymouth Plantation and a short hour + drive to Cape Cod, Rhode Island, New Hampshire, and Vermont. Golf: The Widow's Walk Golf course, a seaside public club noted in Golf Digest magazine's list of top 'Courses to Play'. Call to book tee times at 781-544-7777. Less than 2 miles from the beach house.